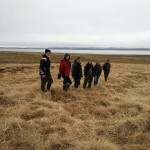 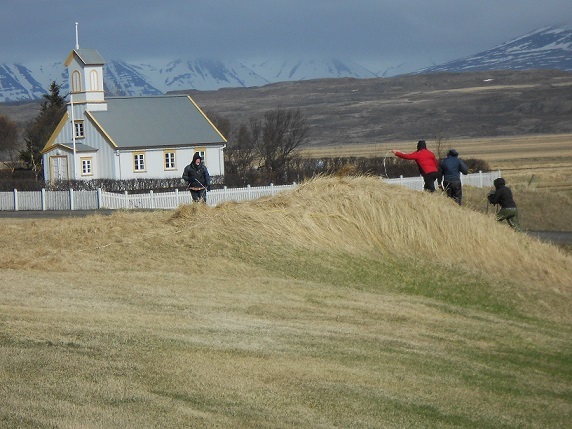 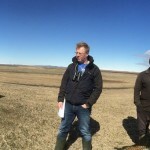 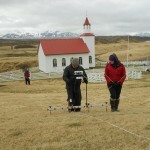 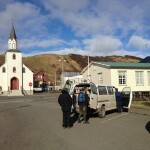 Grampus Heritage are working with Professor Steinunn J Kristjánsdóttir, who has hosted our graduate archaeology groups for the past several years, on the “Monasticism in Iceland” project, taking magnetometers and resistivity equipment to do the geophysical survey of the sites being investigated. 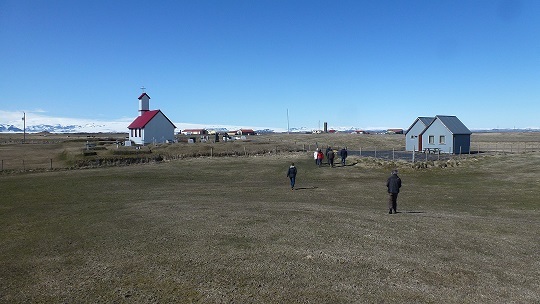 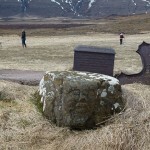 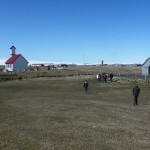 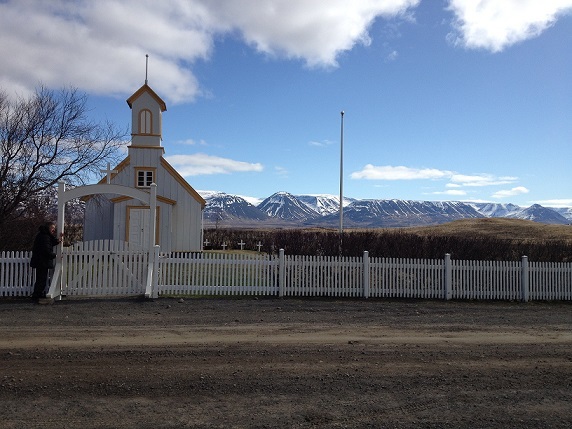 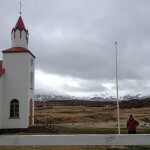 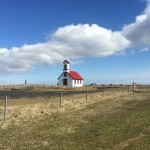 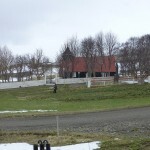 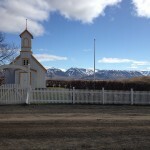 The aim of the project is to investigate Roman-Catholic monasticism in Iceland, with the main emphasis put on the medieval times. 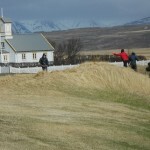 The chief question is in what form the standard monastic plans and ideas moved from the more urbanized mainland of Europe to the thinly populated island in the North-Atlantic, Iceland. 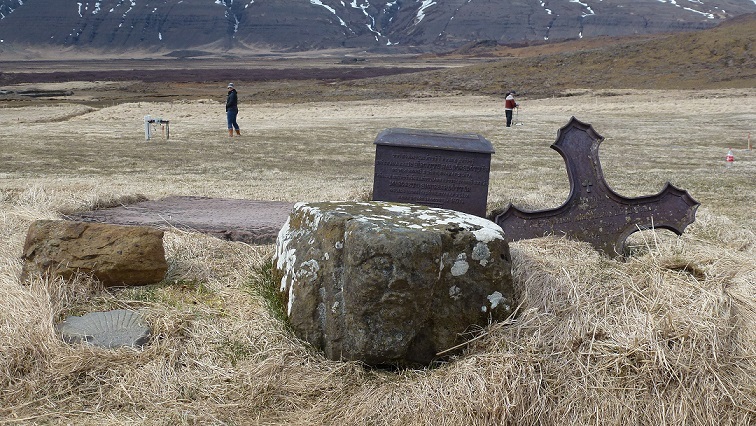 At the same time, the aim is to identify how the monastic institutions – as a foreign product – affected the medieval society in Iceland. 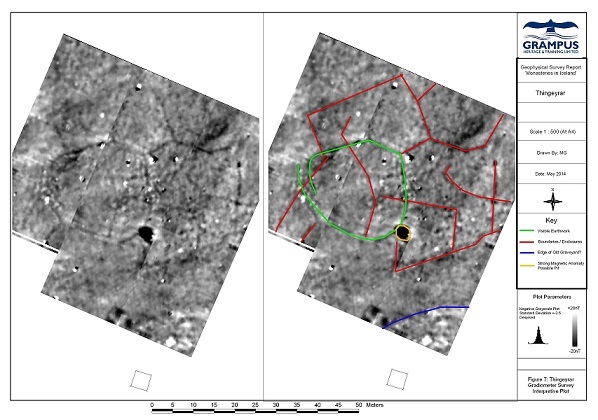 New data will first and foremost be collected through literary examination, recording of relics and surveying on the medieval monastic sites. 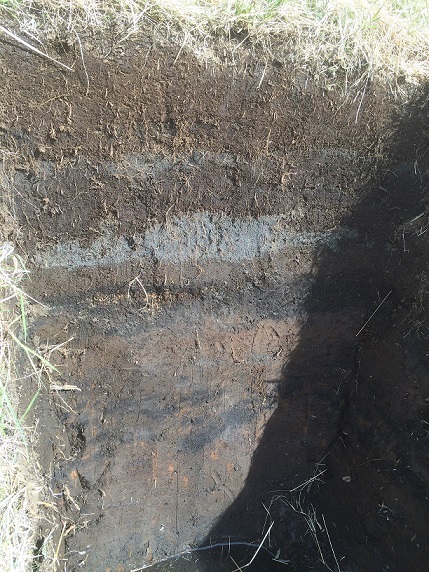 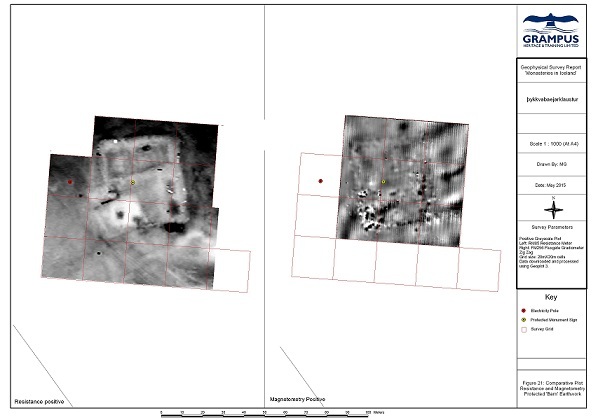 The survey includes geophysical measuring, surface documentation, test pit excavations and analysing of insects, pollen and seeds. 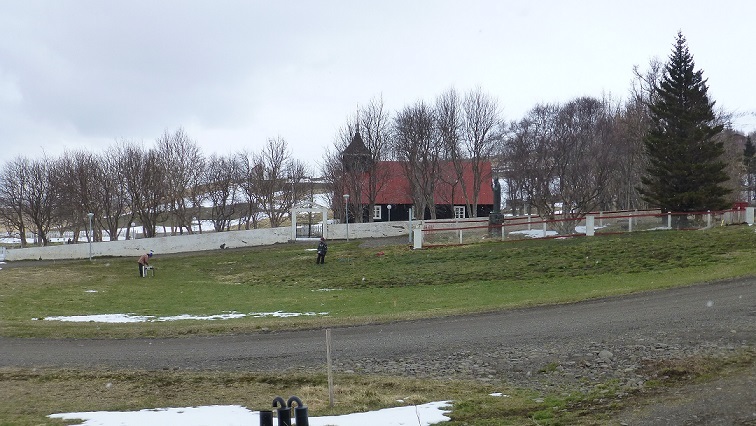 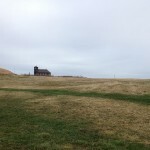 The results will be published in a book on monasticism in Iceland, wherein the history of each of the thirteen monastic institutions operating in medieval Iceland is described. 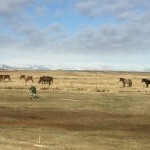 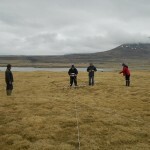 The research is sponsored by The Icelandic Centre of Research (Rannís), The University Research Fund and EU. 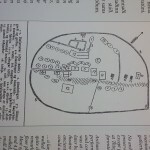 Both seasons work are outlined on this page. 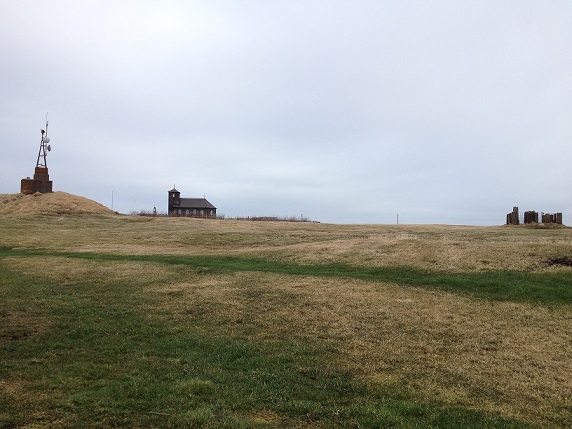 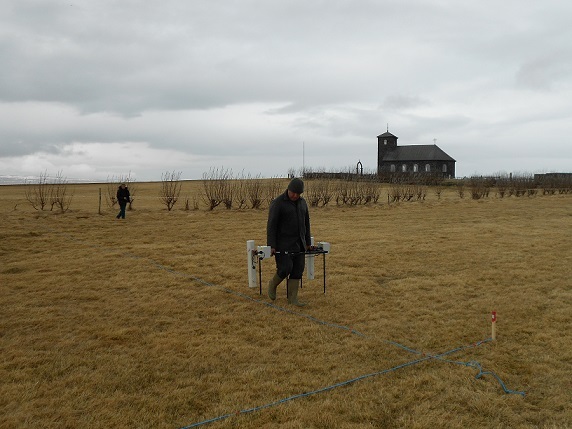 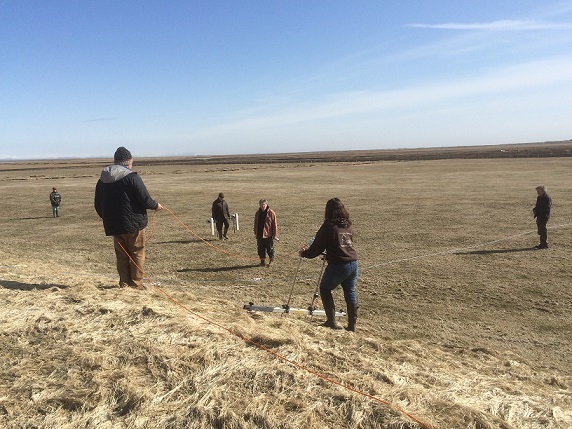 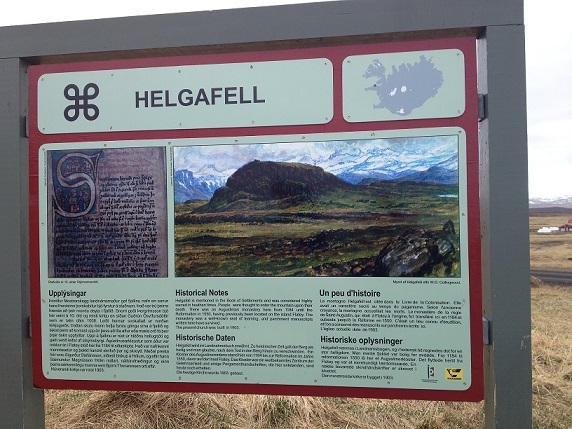 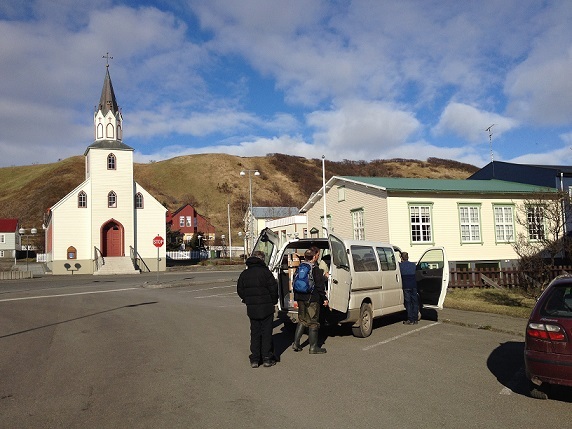 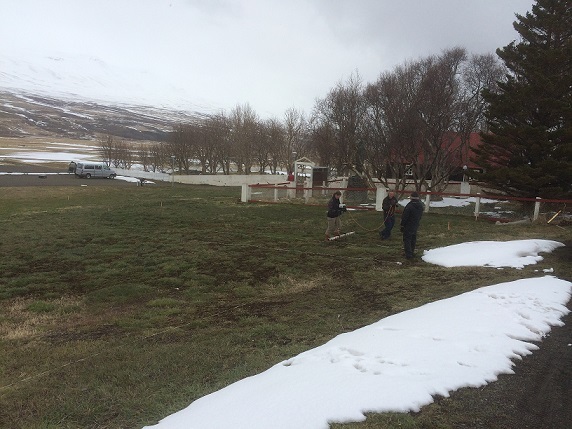 In spring 2014, Grampus staff and volunteers travelled to Reykjavik with our magnetometers and the resistivity equipment hired from Wardell Armstrong Archaeology. 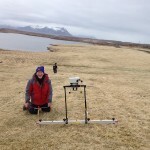 This would be the first time we would be using the equipment in Iceland, so it would prove to be a very useful trip for both Steinunn and ourselves to see how the equipment would work. 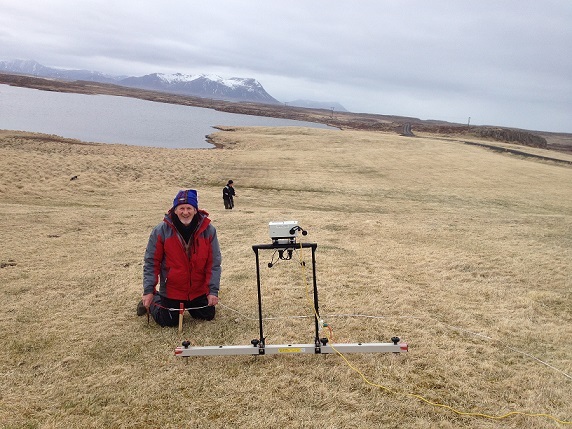 Steinunn and Margret Valmundsdottir would be running their radar equipment as well, so the aim was to see if we could get 3 sets of results for each site and compare them. 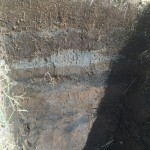 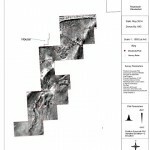 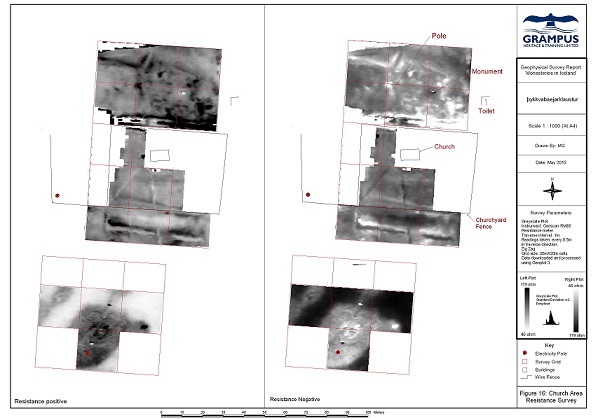 Each site presented its own set of difficulties, ranging from uneven terrain under foot to the natural being too magnetic to gain readings from both instruments. 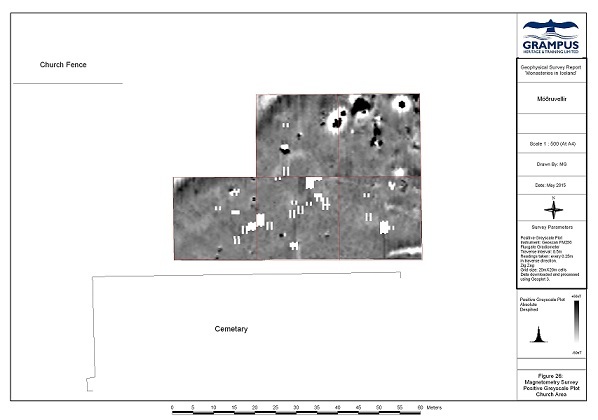 We did, however, get at least one set of results from each site, as shown at the bottom of the page. 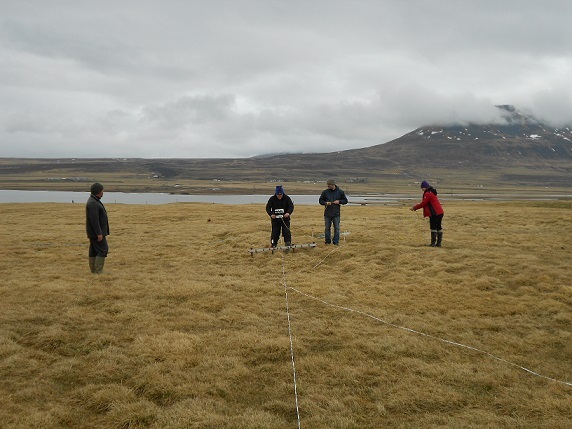 Our results gave targets for Steinunn to work towards over the year, the results of which can be seen on the project facebook page. 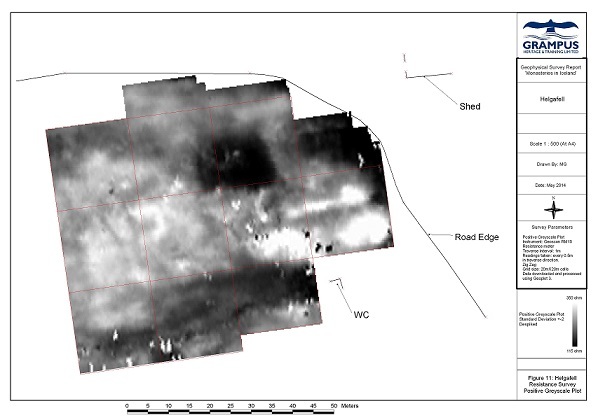 We will be going back in May 2015 for the second season taking our magnetometers and our own new resistivity equipment, and will update this page once that is complete. 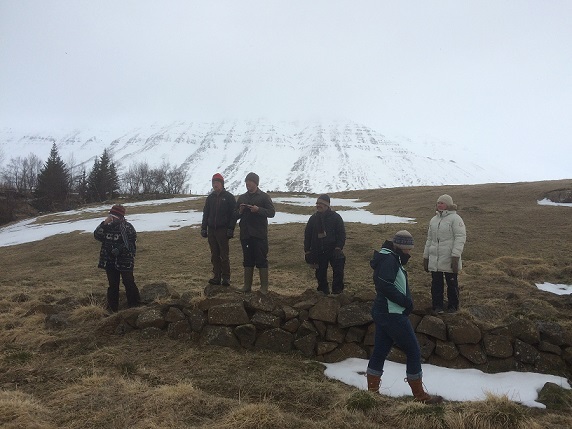 We would like to thank Professor Steinunn Kristjansdottir and Margret Vallmundsdottir for inviting us and working alongside us during this trip. 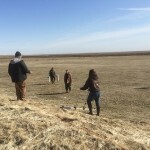 We would also like to thank our volunteers for coming with us, helping us during the long working hours and for contributing to a great project. 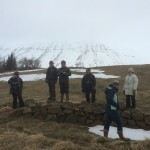 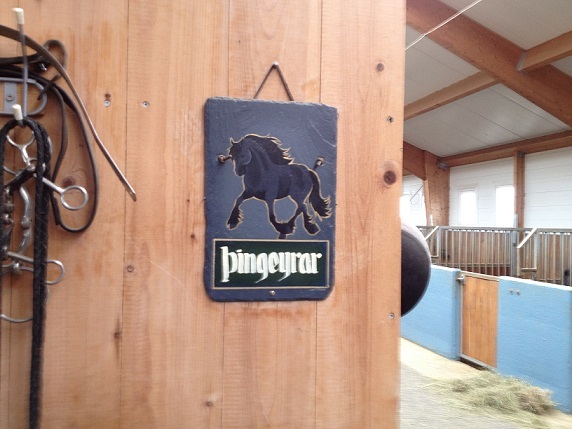 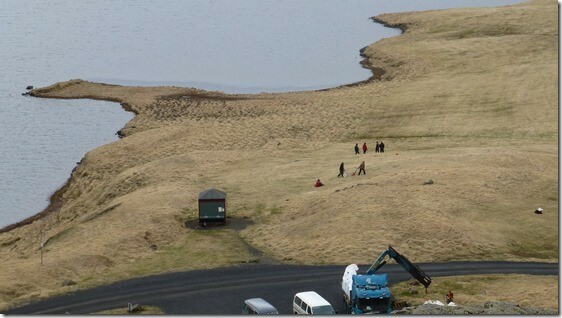 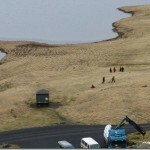 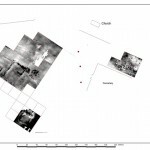 The gallery below shows the sites and the group working with Steinunn and Margret. 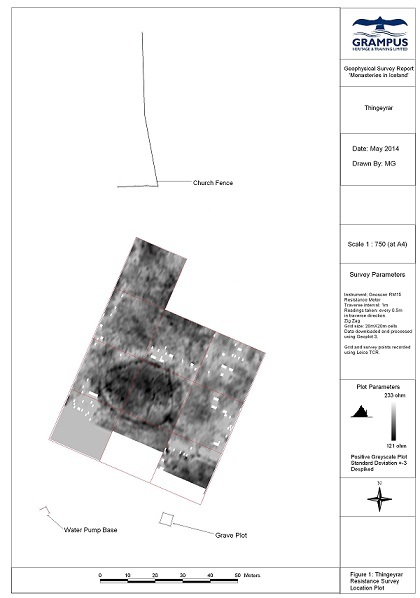 The interim report is available to download (top right of page) and the results can be seen at the bottom of the page. 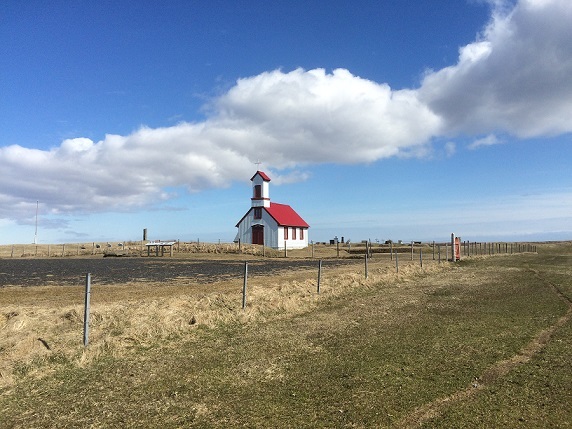 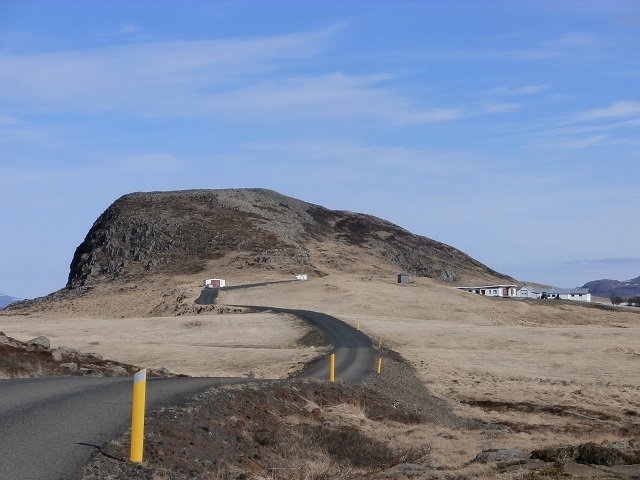 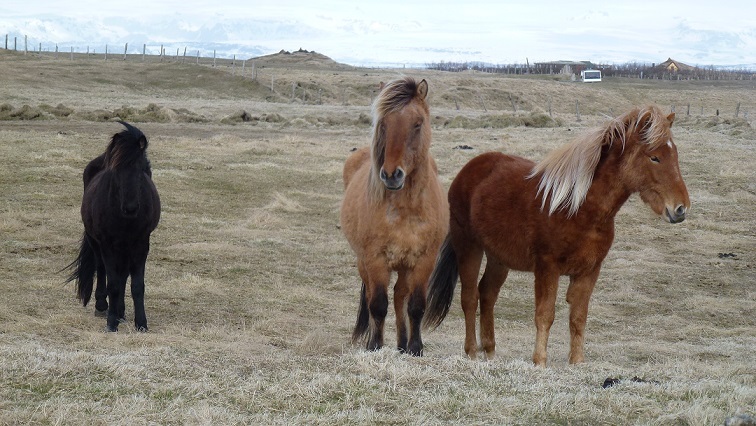 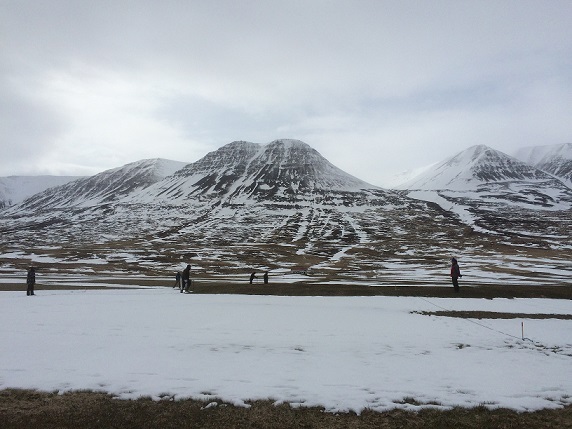 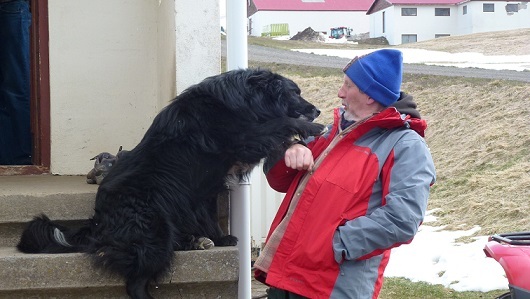 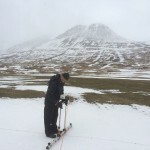 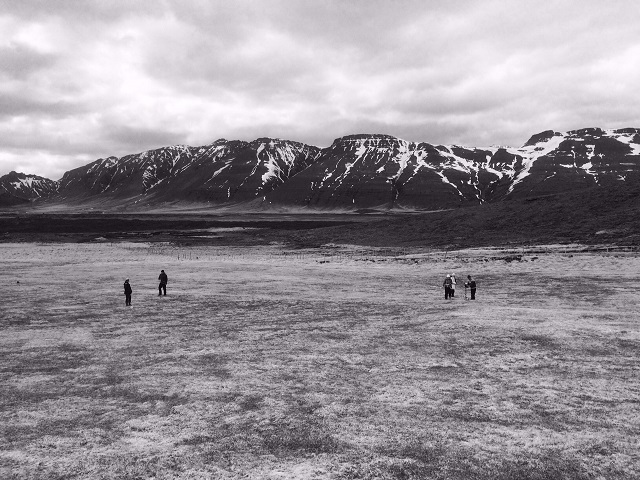 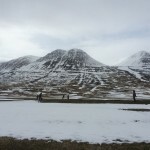 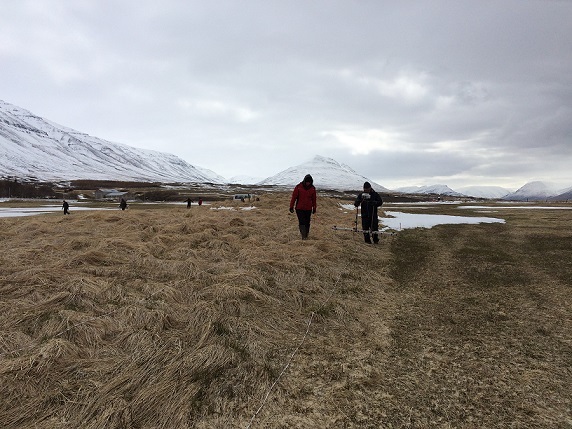 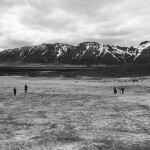 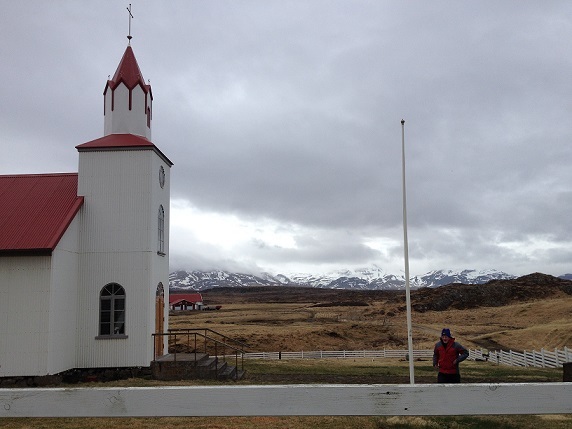 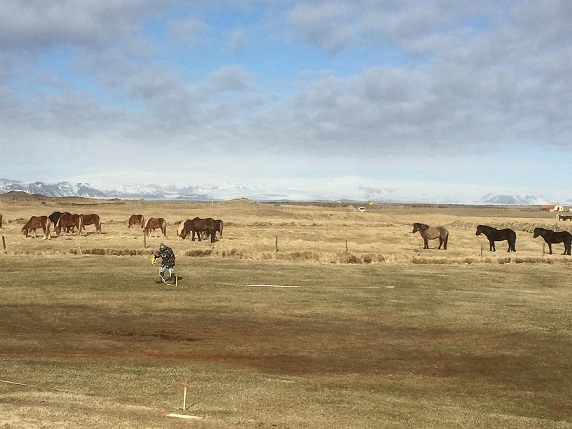 In May 2015, we once again went back to Iceland with our volunteers and our Magnetometers and resistivity equipment to tackle the other sites on Steinunn’s itinerary. 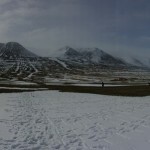 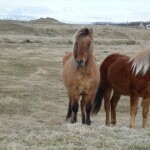 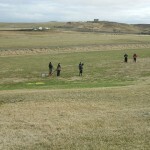 Our first site was on the south coast of Iceland. 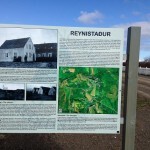 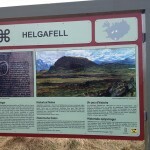 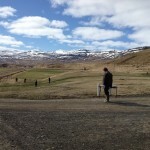 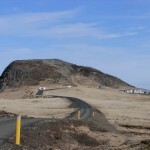 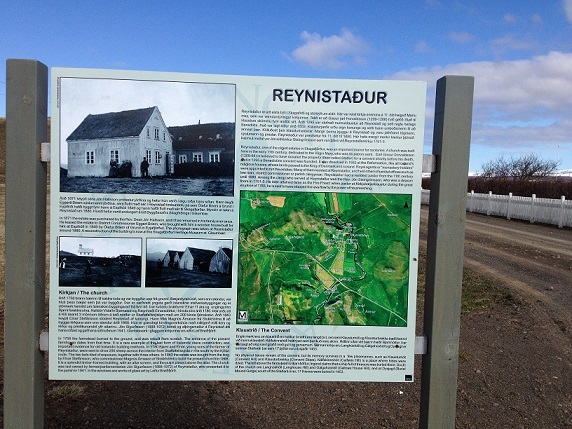 We drove to Þykkvabæjarklaustur, where there were ruins that we were to investigate. 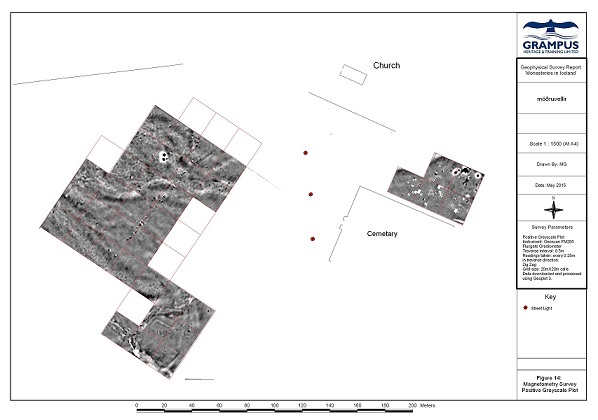 Over the course of 2 days, we did 4 grid sites with both sets of equipment. 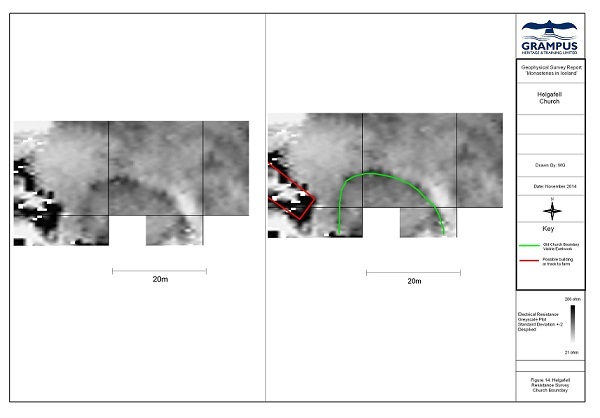 After last year, it was interesting to see how each set would handle the geology of the area, as we were very close to active volcanoes. 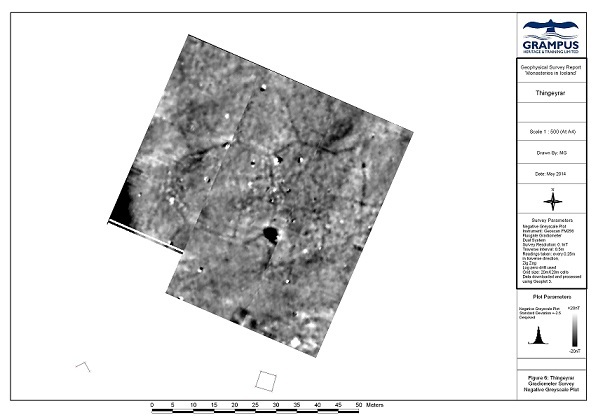 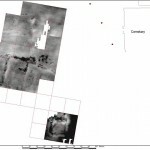 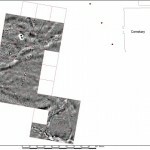 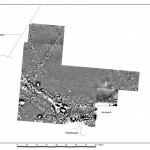 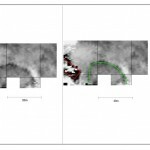 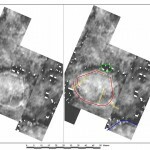 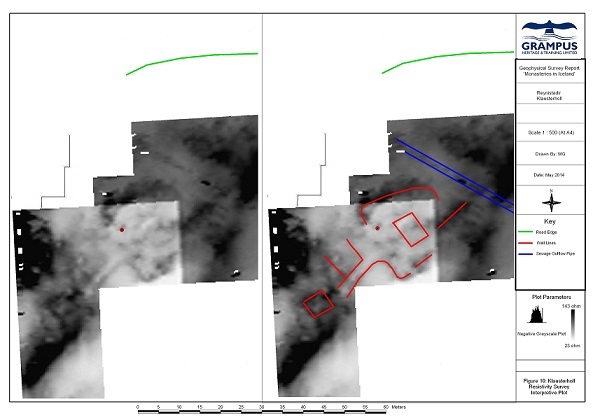 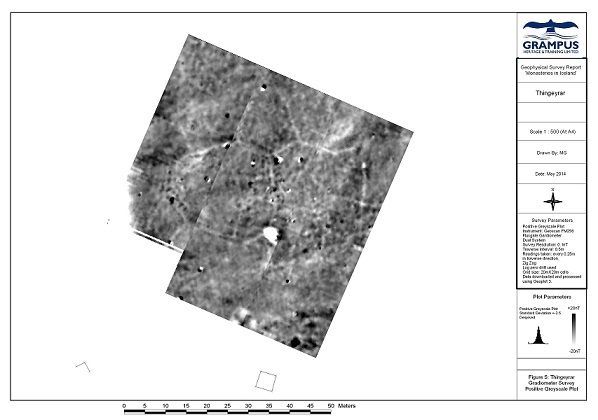 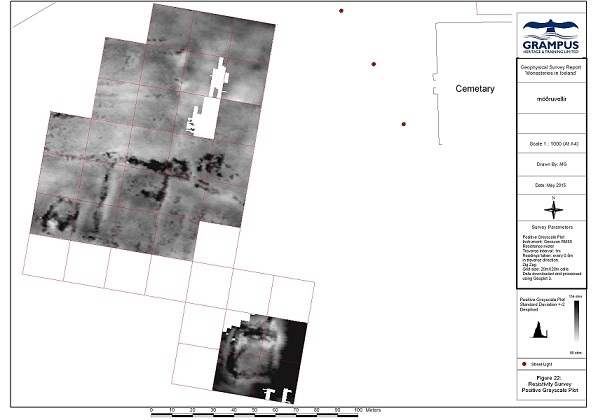 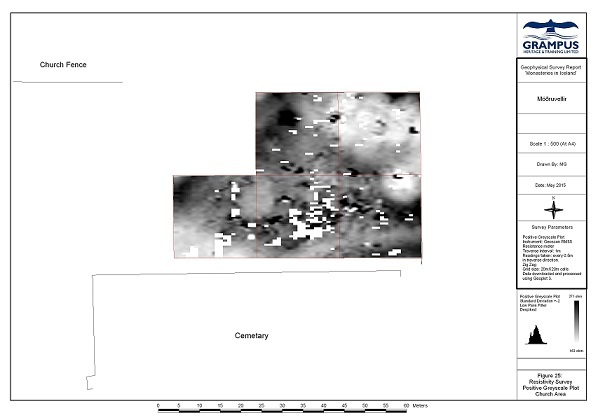 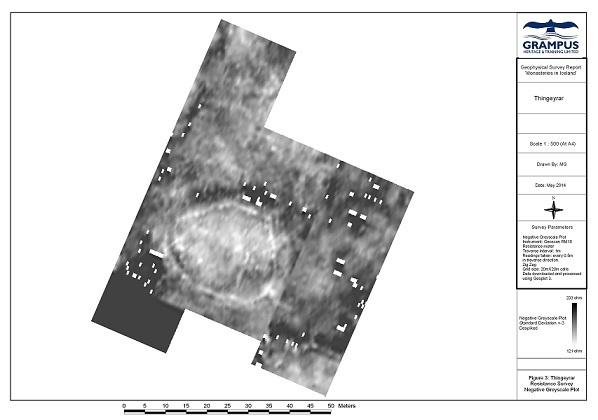 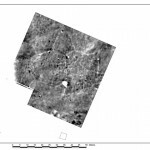 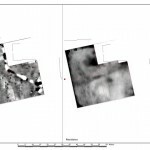 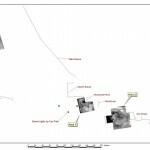 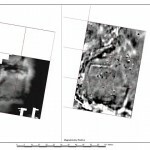 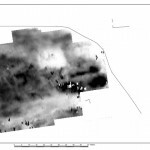 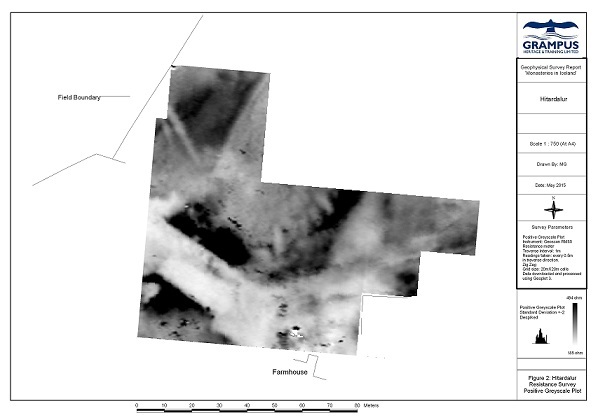 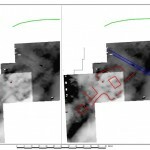 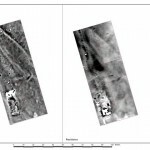 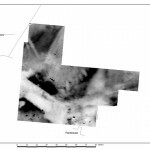 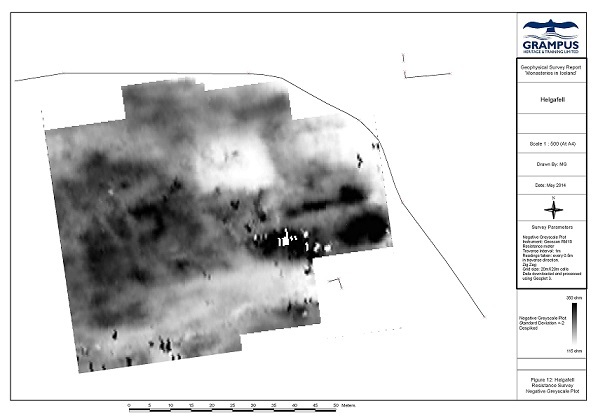 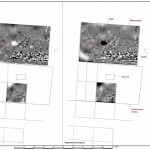 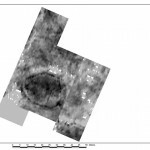 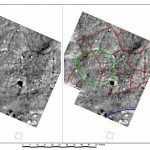 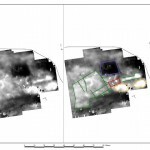 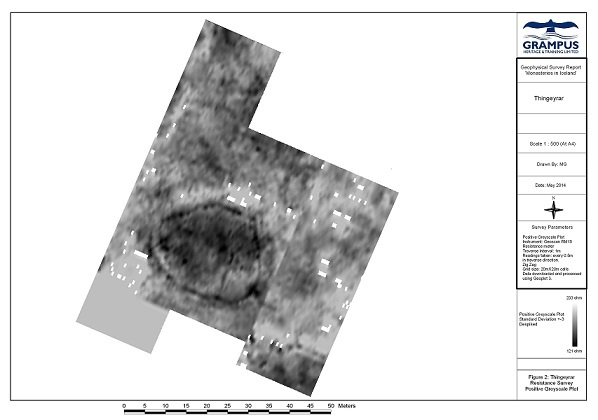 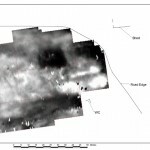 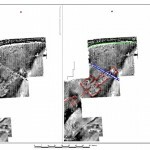 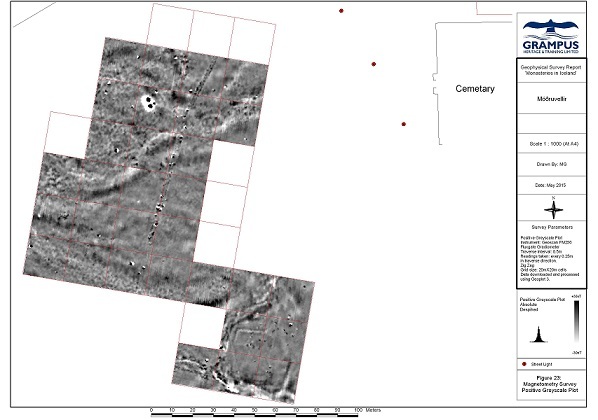 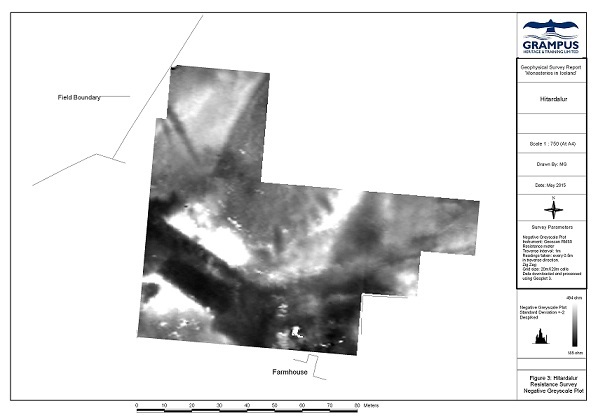 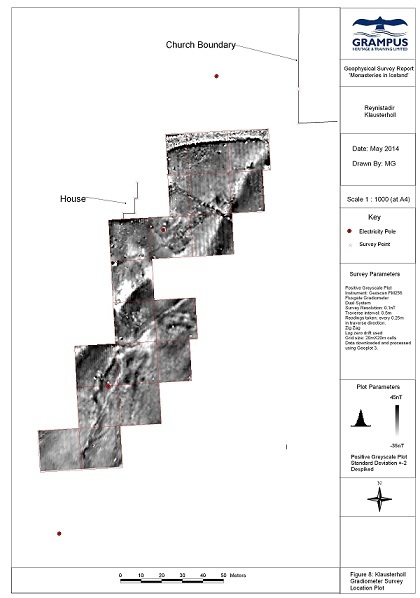 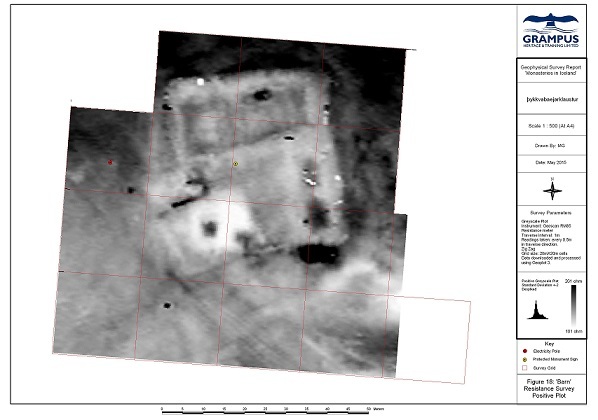 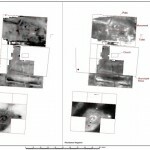 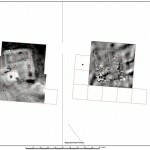 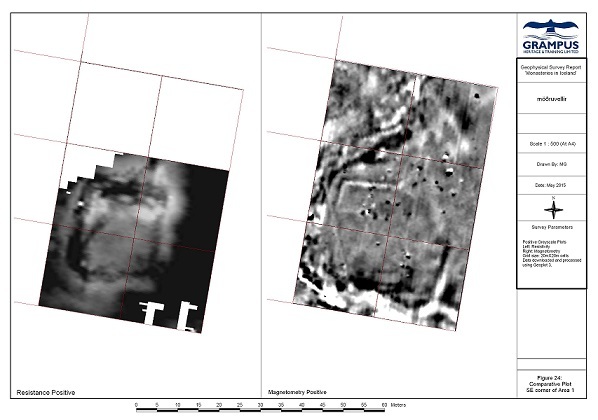 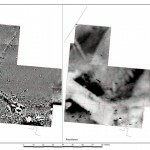 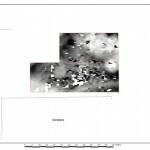 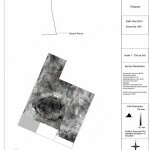 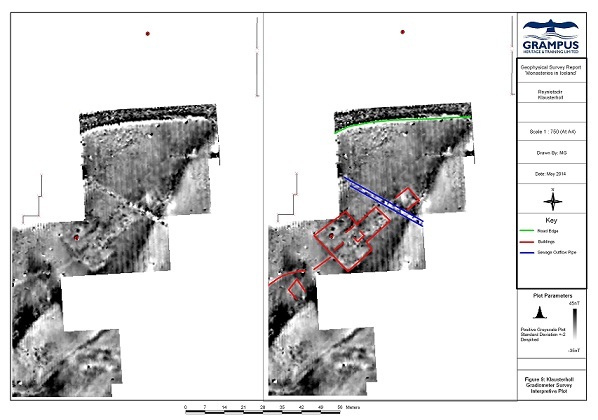 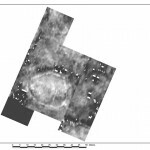 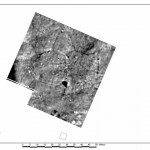 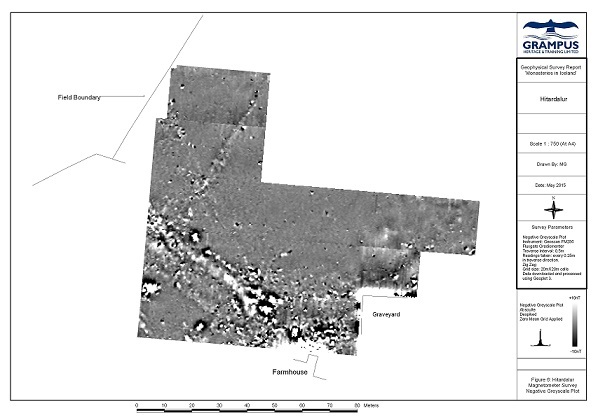 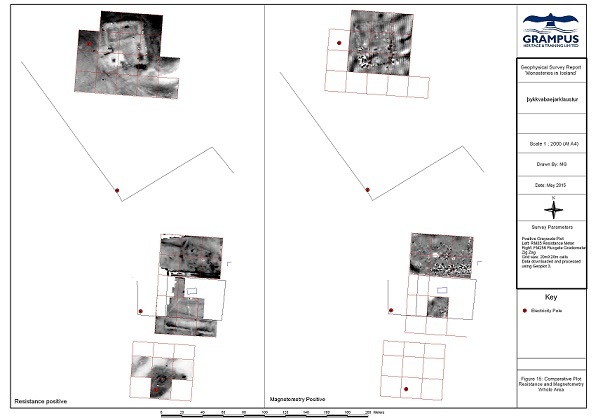 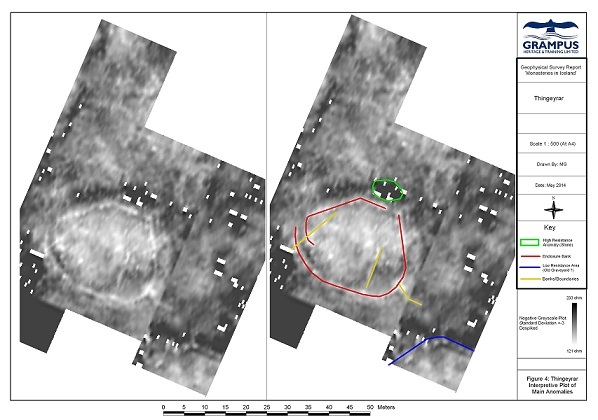 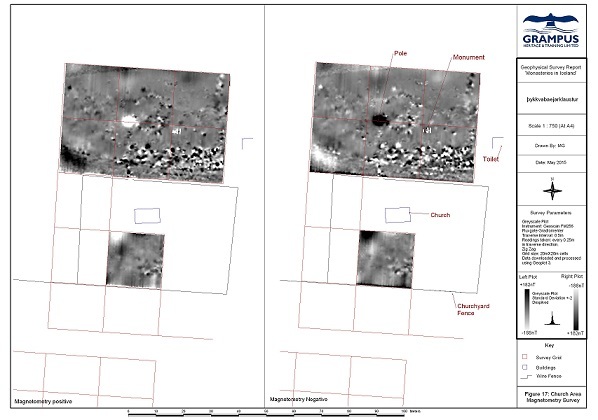 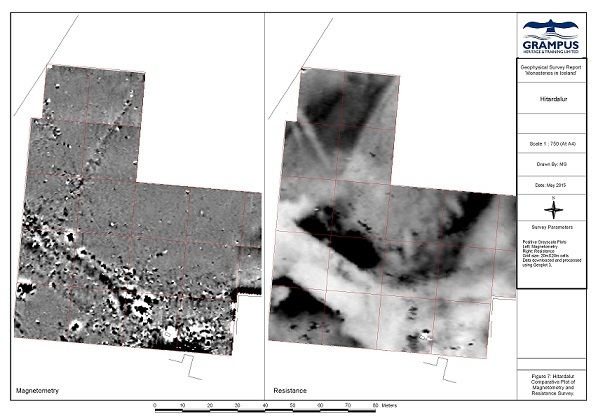 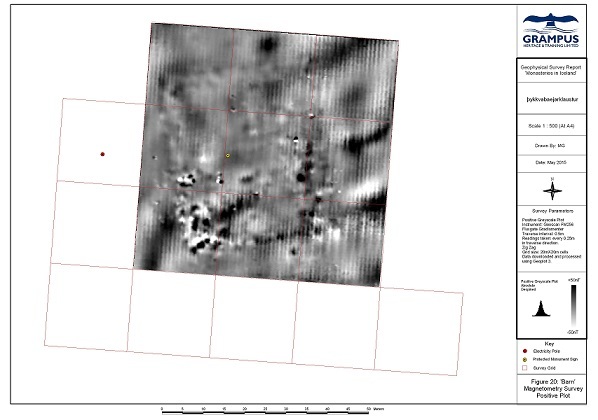 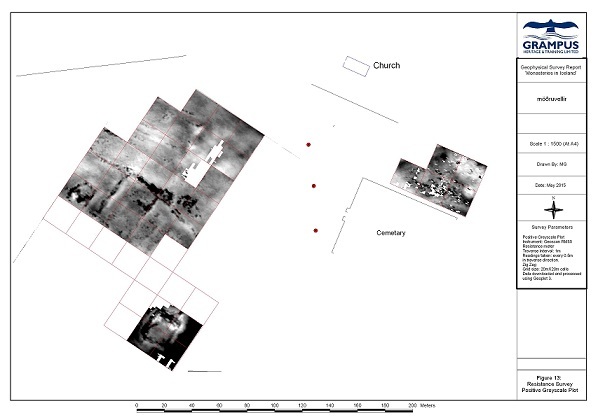 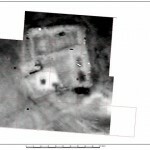 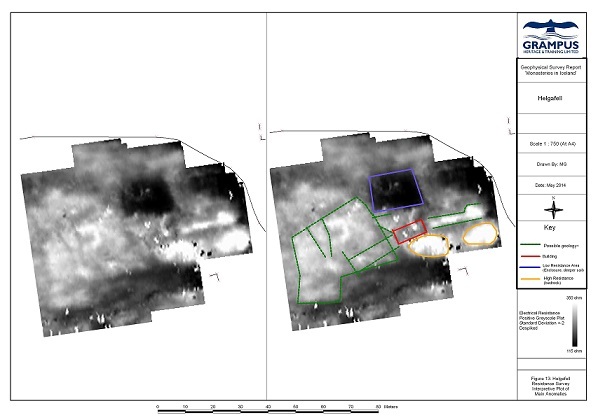 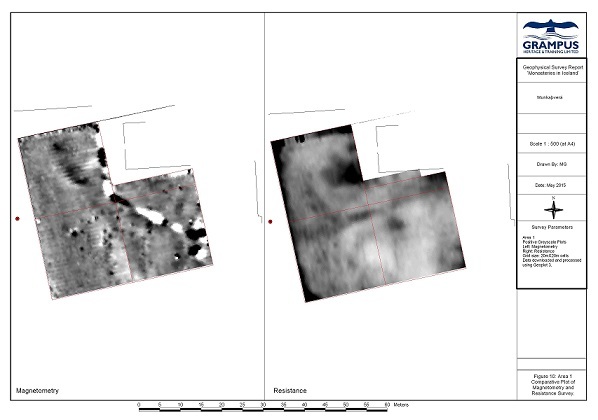 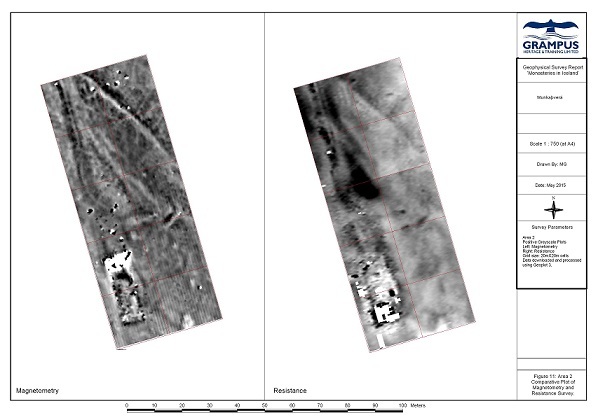 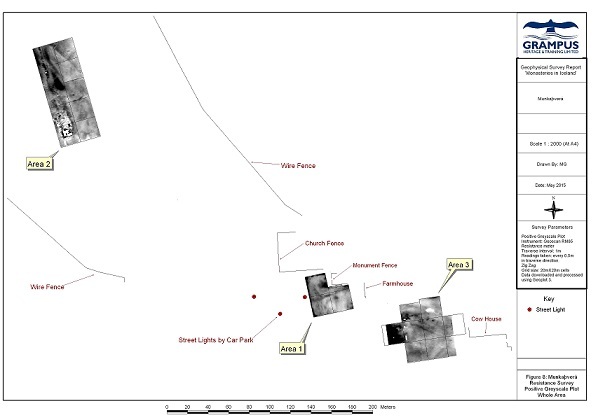 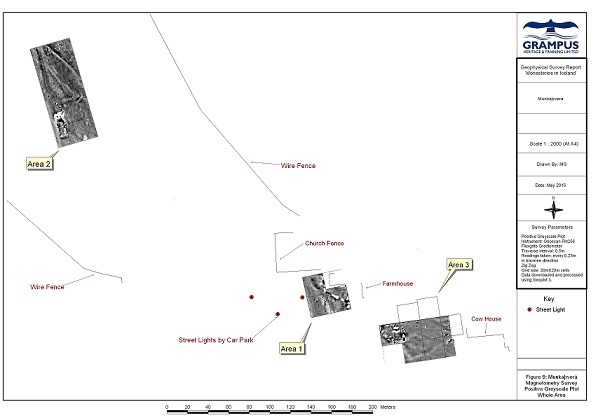 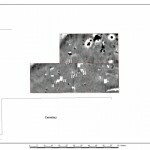 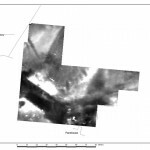 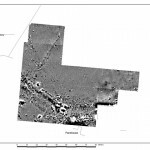 Both sets of instruments performed, though, perhaps not surprisingly, the resistivity results were much clearer than the magnetometers, with the outline of buildings very clearly visible in the results (images 15 – 21 in gallery below). 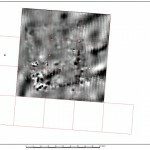 We ended up in the local paper with our results from this site. 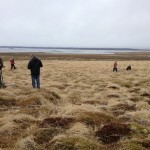 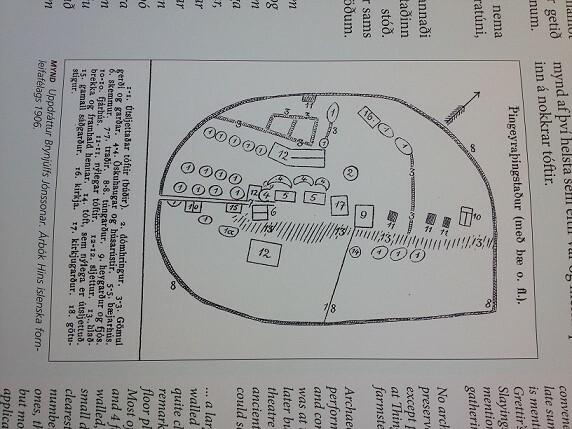 Once we finished at this site, our next targets were in the north. 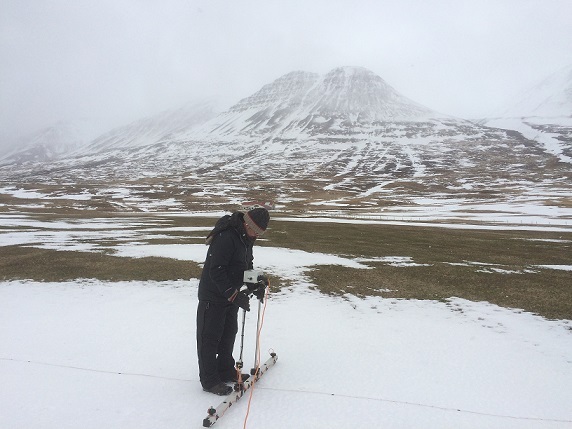 The temperature difference between the north and south was very noticeable and we did wonder how this would affect the equipment. 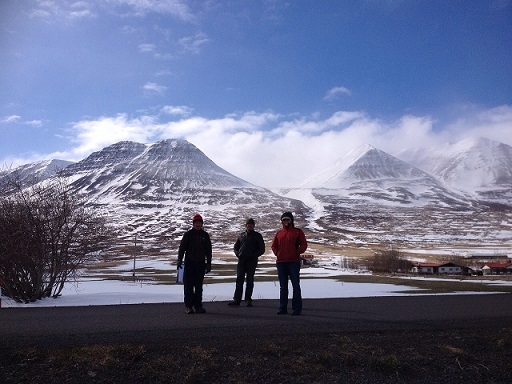 We would be staying in Akureyri but travelling to the 2 sites we would be working on, Möðruvallaklaustur and Munkaþverárklaustur. 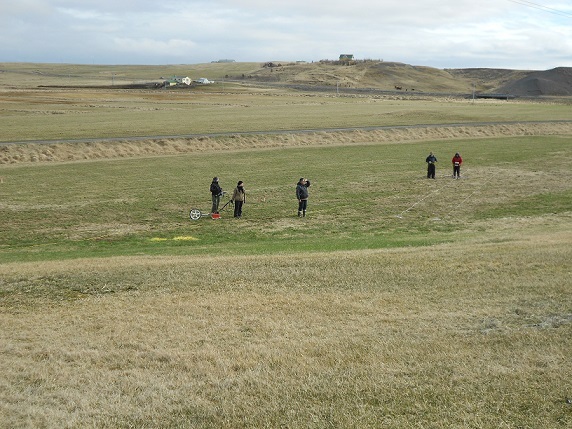 Again, the equipment performed surpsingly well considering the temperatures, though there was some difficulty using the resistivity equipment, due to the ground being frozen. 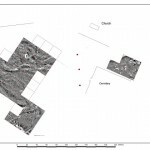 The results from these sites are images 8 – 14 and 22- 26 in the gallery below. 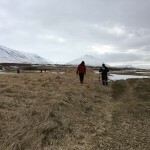 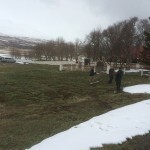 Once we had finished in the north, we went back to Reykjavik and our last site of the trip was Hítardalsklaustur, where we managed to get the grid up and it all done in one day. 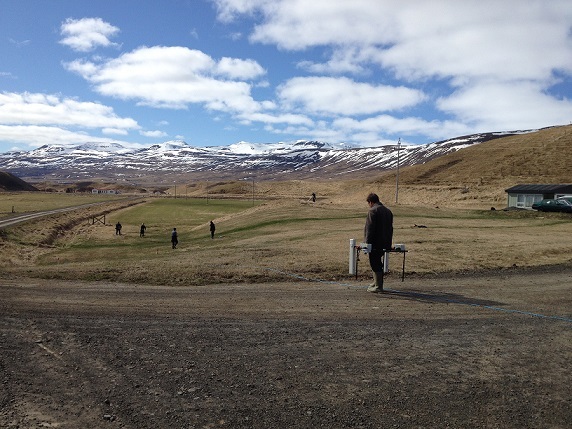 This site was interesting as we were in an area that was full of volcanic flows, so we weren’t sure how the mags would be affected when we first arrived at site. 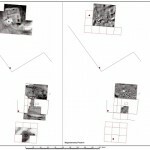 However, there was not much interference and we were able to get results (images 1 – 7 in the gallery below). 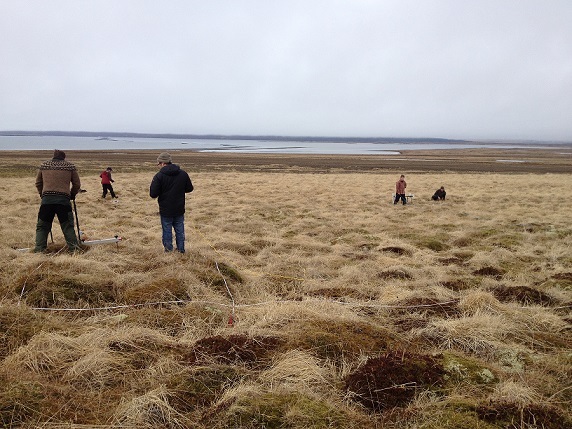 Since we were there, Steinunn and her team have been putting in some test pits. 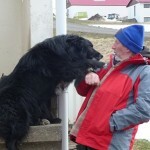 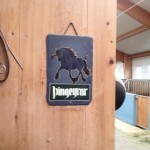 To see an up date on how the project is going, please see their facebook page. 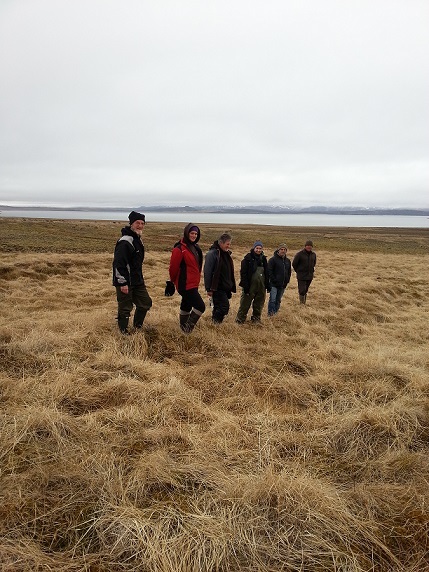 Many thanks to Steinunn and her team, as well as the volunteers who came out with us, on what proved to be another successful geophysical trip to Iceland.